Hala China, in collaboration with the global Chinese company Samanea, yesterday (April 15) hosted The Big C Forum, aiming to build a platform for Chinese businesses to connect with government entities and companies in the UAE. Sheikh Majid Al Mualla, chairman of the board of directors at Hala China, officially opened the strategic event, held at Jumeirah Emirates Towers in Dubai. The forum drew the participation of more than 600 Chinese investors and entrepreneurs as well as businesses and government entities from the UAE, including the Ministry of Cabinet Affairs and the Future, the Prime Minister’s Office, Dubai Land Department (DLD), and the Dubai Investment Development Agency (Dubai FDI), said a statement. Highlighting the opportunities for Chinese SMEs to embrace Dubai’s digital transformation as a means to expand their market share in the Middle East, the event also examined new developments on Dubai’s retail landscape, particularly the growth of the e-commerce industry, it said. According to Fitch Ratings, the value of the UAE’s e-commerce sector is expected to reach $17.8 billion by 2020, accounting for 45.6 per cent of the total market value in the Middle East. “We are confident that the event will open new avenues for reinforcing trade ties between China and Dubai,” he added. 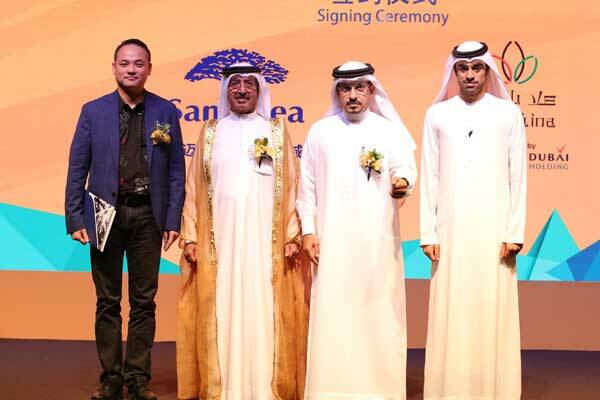 During the forum, Hala China and Samanea signed a memorandum of understanding (MoU) to establish a strategic framework to provide Chinese companies with a deeper understanding of Dubai’s forward-looking trade policies and infrastructure. Headquartered in Singapore, Samanea supports small businesses through hosting them in professional trade centres in key markets that offer marketing, logistics, financial and networking opportunities. As an immediate outcome of the MoU, Chinese entities, including Yiwu Small Commodity City, Zhongshan Lighting and Midea Electric, signed letters of intent (LOI) to partner with Samanea. Launched in 2018, Hala China seeks to explore opportunities to facilitate economic development in Dubai and China through tourism, trade and investment.